MANILA, Philippines — If you're flying to a local destination via Zest Air or Sea Air, chances are you'll depart from Ninoy Aquino International Airport (NAIA) Terminal 4. Terminal 4 used to be the old Philippine domestic airport. It's a one-story building. It's also the oldest among all the terminals in NAIA. Terminal 4 used to be the old Philippine domestic airport. 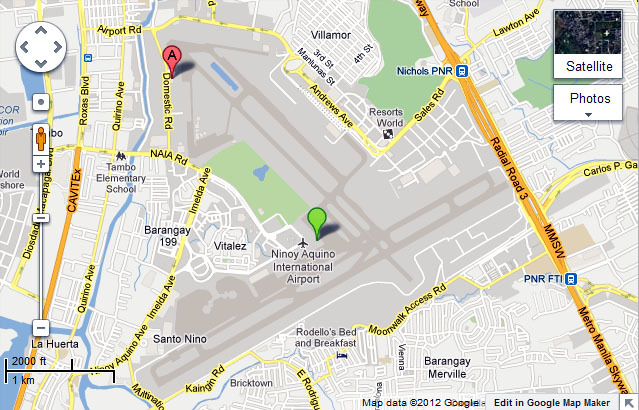 Map around NAIA. Terminal 4 is in red. There's a lighted "exhibit" showing the stuff you can and cannot bring on board. By the way, terminal fee is Php 200. If I'm not mistaken, I think this is now part of the ticket cost. There's an ATM inside just in case you run out of cash. Food inside is a bit on the expensive side. There are rice meals, sandwiches, chips, soup, and even Cinabbon! I love how NAIA 4 has an infant feeding station and a kiddie travelers' lounge! It's a station designed for charging your gadgets! Good thing there's Wi-Fi here to keep everyone sane from all the waiting. Outside going to the plane. No fancy terminal walkways leading to the plane. To save money trying to hail an airport taxi going home from Terminal 4, try looking for a normal taxi on the street. No need to go far. You can wait for one right outside the gate's terminal. Just be careful! For more pictures of NAIA Terminal 4, click here. Thx. I was really looking for this info. Very helpful. hi. do terminal 4 handles international flight? thanks! As far as I know, it only caters to domestic flights. Assuming you take a normal cab, I'm guessing that the fare will be more or less P250-P300. If you take the airport taxi, fare may be P600 or so. Hope this helps.. and I hope I'm correct. did you try riding the shuttle service from naia 1/2? i read somewhere that there is. Nice! Haven't tried it yet. Dude! Thanks for blogging about terminal 4.I was kinda concerned on what to do while i wait. There isn't much to do while waiting for your flight. Good thing there's wi-fi. Hehe. hi, for taxi from T4 NAIA using coupon or meter? How about cost from T4 to Makati? So sorry for the late reply. Just saw this now. If I'm not mistaken, there are only metered taxis in NAIA T4: airport taxis (yellow) and normal taxis (white). For foreigners, it's always safer to take the airport taxis, even if it's more expensive. From T4 to Makati, it would cost around Php 180-200 for normal taxis. Is there a place in t4 where we can leave baggages? Hi Ulpiano, Im not entirely sure. From the looks of it.. I don't think so (and it doesn't seem *that* safe to me). But maybe there is. I'll check next time! Thanks. hi bro, good review. i'm from indonesia and will be traveling to philippines soon. i have 5 hours layover in Terminal 4 for connecting flight. is there any lounge, cafe, bar or 7/11 near arrival area? thanks. mabuhay! Thanks for the info. This is a big help. Is there a parking lot in T4 where I can leave my car for a number of days? Do you think it's safe? Hi! We will be travelling to Kalibo, I just want to ask, aside from the Terminal Fee, what are the other fees we need to pay? By the way, I found your blog very informative. From T4 to Marikina, where we can get the safest taxi and how much is fare? Hi Henson, can you recommend a place to stay near Manila airport?